Does This Look Like the Coldest Place in the United States? On This Date in History: At this point in the winter season, data from the National Snow Analysis reveals that 49% of the nation is covered in snow. Last month, that total was 44.8% but, in between, I’ve noted some days where the snow cover was as high as 70%. We are in a weather pattern that has been persistent with a general ridge in the west and a trof down through the front range of the Rockies or through the midwest. While there have been some big storms on the West Coast, most of the action seems to be riding up the northern part of the Rockies and then down deep, often way deep, into the South with the base of the mean trof generally in the heart of Dixie. The mean long wave has been such that it tends to take storms just off the East Coast. The East Coast has dodged a bullet for the most part because, while there have been a couple of big boppers nail New England, much of the Eastern Seaboard has missed out on several systems that, had they been about 100 miles further west, would have buried the I-95 corridor from North Carolina to Maine. It’s pretty cold now but a super cold outbreak has for the most part been avoided. While some records have no doubt been set, certainly no one has come close to all-time low temperatures recorded in history. Back in late 1970, there was a big high pressure ridge situated over Hawaii but, by early 1971, that big ridge shifted to the East. A new mean ridge set up over the Bering Sea and created a strong blocking pattern over the Central Pacific. Northerly flow across the Bering Sea remained persistent but the southern part of the December trof moved east to set up a strong, broad cyclonic circulation across the Mississippi Valley to the Atlantic. 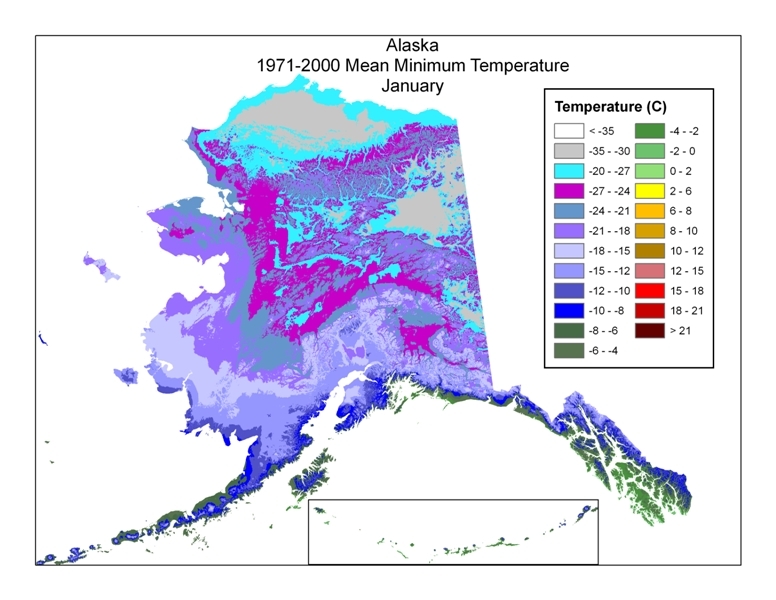 All of Alaska was much colder than average that January with Fairbanks, Alaska not getting above 22 F degrees below zero for 18 consecutive days, which is a record for such cold of such duration. The record-setting cold month in Fairbanks resulted in an average temperature for that month in that city of 31.7 F degrees below zero. 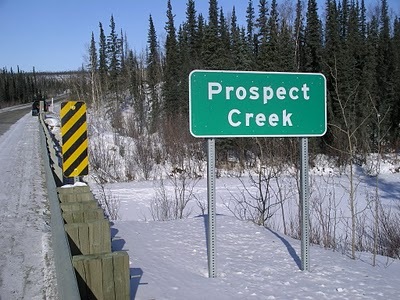 About 200 miles Northwest of Fairbanks and 25 miles Southeast of Bettles, AK, one will find tiny Prospect Creek, Alaska. It was first settled as a mining camp in the gold rush days. 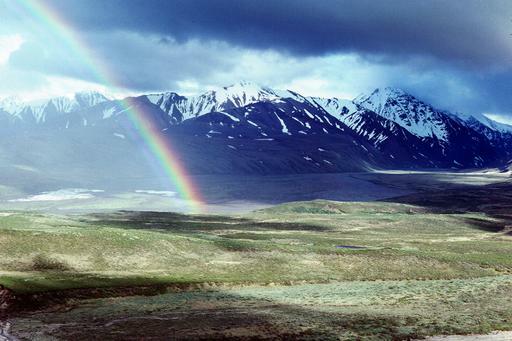 Most notably, a camp was built there for the builders of the Trans-Alaska Pipeline in 1974. The near ghost town was transformed into the residence for some 27,000 workers and to serve pipeline station number 5. There is not much at the location and the camp was little more than housing with some washrooms. 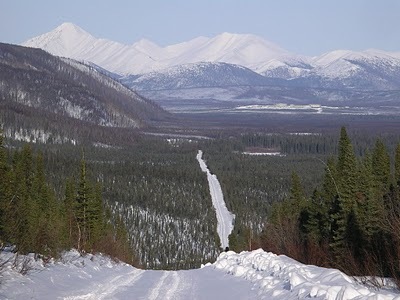 When the pipeline was completed in 1977, Prospect Creek was once again abandoned, though in 1992 it did serve as a base of operations for some people working on the rebuilding of a bridge along the Dalton Highway. Not only did it serve to house workers but also their families and I’m sure that mom was happy to bring the kids along to live in the wilderness north of the Arctic circle at about 67 degrees North Latitude. It’s so far north and so cold that it’s really more or less a desert as it only gets between 0 and 10 inches of precipitation per year. June and July aren’t too bad with average highs of 71 and 73 respectively. But, January and February average highs are 2 and 10 degree respectively and 6 months out of the year, the average high is below freezing. In spite of the cold, you can find Black and Brown bears in the area as well as Bald Eagles. But, you probably won’t find Sarah Palin wandering about as it’s about 530 miles North of the former governor’s home town of Wasilla. Aside from all of this, it’s tough to find much about Prospect Creek and most likely would not be found anywhere on the internet or in encyclopedia’s if it were not what happened there on January 23, 1971. The big fat ridge that parked itself over the region in January 1971 and brought Fairbanks such frigid conditions affected the entire state. I suspect that the center of the high pressure ridge must have moved directly over Prospect Creek because, on this date in 1971, the mercury at Prospect Creek, Alaska fell all the way to 79.8F degrees below zero, giving it the record for the coldest temperature ever recorded in the United States. For all of North America, the low that day is second only to Snag, Yukon Territory, Canada that hit minus 81F degrees on February 3, 1947. But, Snag’s elevation is 2100 ft while Prospect Creek is somewhere in the neighborhood of 1000 feet above sea level. Mt. Washington, NH has the distinction of having the lowest annual mean temperature of 26.5F and the lowest mean summer temperature (51.6F) in the lower 48. In 1954, a big old 1070mb high settled in over Montana and on January 20, the temperature at Rogers Pass in Lewis and Clark County fell to -69.7F to set the coldest temperature ever recorded in the lower 48 states. Rogers Pass sits about 150 feet below the Continental Divide at around 6000 ft in elevation. It’s interesting that just 11 days before, the lowest temperature on the Greenland Icecap was recorded at -86.6 degrees. 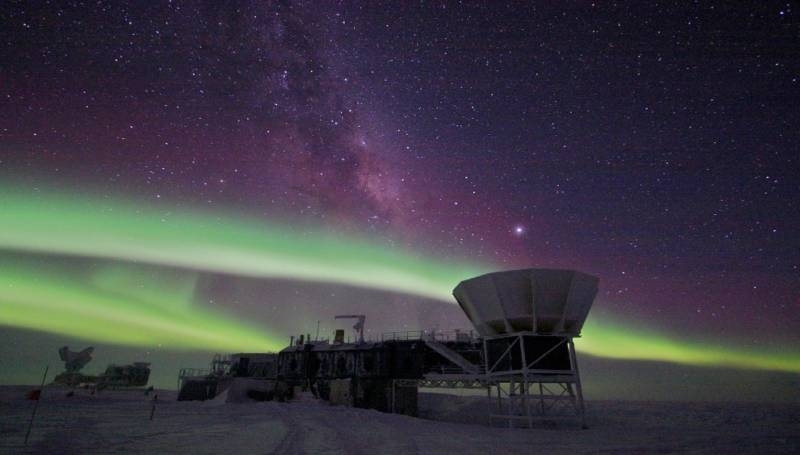 That is nothing compared to the all-time planet low temperature of -128.6F on July 21, 1983 at the Amundsen-Scott Station,which is just a few hundred yards from the geographic South Pole in Antarctica. With all of this, it’s no wonder that Prospect Creek has zero population today. But, you can mail a letter there, if you like. The zip code is 99726. I suppose the postal carrier that gets that mail-route is being punished because “nor rain, nor snow, nor dead of night” does not include “nor 79 degrees below zero.” By the way, in case you are interested, you can take a tour that includes Prospect Creek. I might suggest June or July. Weather Bottom Line: Well…after reading all of that, you should feel down-right warm. Maybe not. We have a hint of a warm up in the week ahead but it’s not much of a hint and it won’t last long. First, we have a little disturbance wandering across that is damping out, or weakening so we may have some snow showers today and tomorrow. Then another system comes across the south and an accompanying disturbance coming out of the midwest will also get damped out so we may have some snow showers Tuesday and Wednesday too but I don’t think it will be all that terrific. We warm up slightly to the mid 30’s by the end of the week and may even hit 40 on Saturday but that’s about it because on Sunday, we’re back down to highs in the 20’s. Break out the tanning butter on Saturday. Some of you may remember The Gong Show. People came on the show and the judges would give them a score. If the acts were really bad, a judge would stand up and bang a gong that meant the act was off the show. I think the winner of the show got something like $32.98 or some such odd, low number. America loved it for awhile as they loved to watch the stupid, crummy acts, not the good ones. We love competition but sometimes we seem to gravitate to the most preposterous or bad performances. One of NFL Films most popular team biopic is on the Tampa Bay Buccaneers that lost 26 games in a row and every game in a season…the only team to do so in modern times until the Detroit Lions joined them this year. 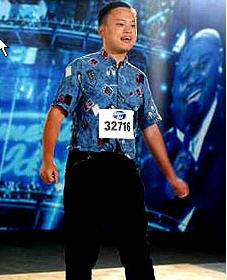 And of course, there is American Idol and the infamous William Hung. He is probably more well known than most of the winners. This is not new with America. 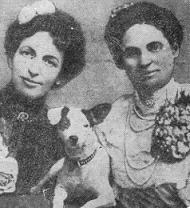 Before the Gong Show and the Buccaneers and William Hung, there was the Cherry Sisters. They were so bad, they became a smash hit. 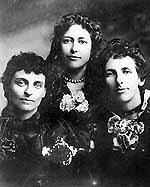 The Cherry Sisters first took to the stage on this date in 1893 in Marion, Iowa. They received $250 for a one hour show. Pretty good money. In Marion, the folks must have been kind because it was in Marion that they got their only good newspaper review. When they took their act to Cedar Rapids, the local Gazette referred to their performance as “ultimate gall.” The paper also mentioned that people threw overshoes at the ladies. See…Iraqis did not invent the act of throwing shoes at people on stage. Not to outdone by their neighbors, the people of Dubuque tossed a tin wash boiler, turnips and sprayed them down with a fire extinguisher. I’m not sure what a tin wash boiler is but, who brings turnips to a show? The newspaper in Davenport, Iowa issued a warning to would be concert-goers. Rocks larger than two inches would not be allowed in the theatre! I guess Constitutional rights only go so far….one inch rocks were okay but two inches? Forget it! Eventually, the act was so bad, it became popular and the “The Celebrated Cherry Sisters” made their way to the big time of the Big Apple. Yup…they went to Broadway in 1896 under the guidance of none other than Flo Ziegfeld himself. People came to the theatre in droves just to hurl insults and garbage at them. Much like the Blues Brothers, the stage manager stretched a fish net across the stage to protect them from hurtling objects. But, it finally went too far. The truth is that Jessie died of typhoid in 1903 at age 31. It also called the sounds the sisters made “were like the wailings of damned souls.” I don’t know why they sued the Leader because Billy Hamilton of the Odebolt Chronicle in western Iowa called the ladies “three hideous creatures surpassing the witches of MacBeth.” I guess being a hideous creature and people throwing rocks and garbage was one thing but telling the public that Effie was 50 was too much. So what did the judge do? He had them perform in court and the case was closed. He ruled in favor of the newspaper saying that “Freedom of discussion is guaranteed by our fundamental law.” This was not just any court though…it was the Iowa State Supreme Court and, while the Sister’s act may be long forgotten, the case has become a textbook standard citation of First Amendment law under the moniker, the Cherry Case. I don’t know how much money the ladies made but if they pocketed $250 in Marion, Iowa they must have done pretty good in New York. Nevertheless, I doubt if they planned on being remembered in history for a lawsuit against a newspaper that ridiculed them mercilessly. Another case of unintended consequences. Weather Bottom Line: Told you there would be snow and the rest of the forecast will hold true as well with pretty cold temperatures through the weekend. Snow White was driving to Louisville on Thursday and I told her that she would probably not get snow until about the time she it Lexington. She reported that at the 75/64 interchange, she saw her first snowflake. She took some issue with the conditions of I-64 on Thursday afternoon from about Shelbyville on in. Not sure why the road was not addressed since this storm was well known in advance. On Monday, there is another chance for snow but this one probably won’t be as significant as the system is southern in nature and will be traversing the Dixie states well to our South. Nevertheless, some over running moisture will bring at least some snow showers if not light snow We may get back above freezing on Thursday afternoon. You can even get a wristband (click image) for National Nothing Day! This Date in History: Everyone says that they are so busy these days, or at least we act like we are. I wish I had a dollar for every time someone tells me that they are too busy to do something. Do you think that you could just do nothing? There is an AC/DC song called Down Payment Blues with a line that says “I know I ain’t doin’ much, doin’ nothin’ means a lot to me.” My friends and I in high school always liked that song. I guess Bon Scott liked doin’ nothing. After a bunch of poor grades on a test, a bunch of my students’ excuse was that they didn’t have time to do the reading assignment. A few days later, I tricked them when I asked if they had seen the UL-UK football game, the VH-1 Awards or Dancing with the Stars. When they all said that they had, I told them to never tell me that they don’t have time to do the reading assignment. We use the excuse that “I don’t have time” to do a given thing when, in fact, we choose not to use our time in that way. We say that we don’t have time to visit a co-worker in the hospital but have plenty of time to watch that favorite TV show. So, the question on the table might be, could you do nothing or are you too busy? I think that everyone’s life is an interesting story. But, I suppose society doesn’t much think so. The lives of everyday people tend to go by the wayside while instead we turn our attention to people who yearn for attention even though they didn’t do anything to really earn that distinction. Think of all of the celebrities in the spotlight today who really have done nothing except be in the spotlight. So, maybe we do like to celebrate nothing. If that is the case, then today is your lucky day. It would seem that the life of a newspaperman would be interesting but, in the case of Harold Pullman Coffin, apparently that was not the case. One cannot find anything about the life of this journalist; not even the name of any newspaper for which he worked. Children Come First have a writing contest for the day but the link to the Smithsonian it features leads nowhere. But, you will find that he was described as a “newspaperman” and he managed to leave his name for posterity and history simply by decided to celebrate nothing. On this date in 1973, newspaperman Harold Pullman Coffin designated January 16 as National Nothing Day. I’m not sure of his motivation but he wanted to “to provide Americans with one national day when they can just sit without celebrating, observing, or honoring anything.” Beyond that quote and the assertion that he was a newspaperman, there is nothing more. It’s too bad that Congress doesn’t recognize Coffin’s day for about half the year, then the nation might be able to get something done. Abolitionist Coffin Related To Harold Pullman Coffin? Anyway, I”m forced to speculate regarding Mr. Coffin but I have found that the University of Nevada at Reno is the holder of the E.B. Coffin collection. It is a set of personal papers and photographs derived from the Edward Baker Coffin family. Edward Baker Coffin was born in 1861 in California. His family was from Nantuckett, MA and his uncle or great uncle was probably aboltionist Levi Coffin as his brother was named George Levi Coffin. Edward B. Coffin married Ida Pullman of Elko, Nevada. They had 4 children, including Harold Pullman Coffin. Now, that is a rather unusual name so it’s probably our National Nothing Day founder or at least a relation. Now, the listing of Harold Pullman was fourth in the list of the children so we may presume that he was the youngest. But even so, if we assume that Edward Coffin was 30 when Harold was born, then Harold Pullman Coffin would have been 82 when he designated National Nothing Day as an Un-Event. Andy Rooney just celebrated his 92nd birthday so, it’s possible that Coffin could have been still working as a newspaperman. (Rooney Bio) But, it seems more likely that the founder of National Nothing Day was the grandson of Edward Baker Coffin. But, we know nothing of the birthday of Harry Pullman Coffin and Andy Rooney says that Unhappy Birthday is a better greeting or none at all for someone looking at another year on the planet. Besides that, it’s probably better that we know nothing about the founder of National Nothing Day because, if we knew more, than that would be something. Weather Bottom Line: Today may be nothing…and the Seattle Seahawks seemed to have taken the day seriously…but tomorrow is something of note as we celebrate the life of Dr. Martin Luther King, Jr. There are lots of events around town but, unfortunately, the weather will not be very cooperative. The good news is that we will be dancing with the 40 degree mark. The bad news is that its going to be wet. I would much rather have a bunch of snow than cold, dreary rain. Well, we can’t have everything and I suspect that after the cold and rather snowy winter we’ve had so far, many of you would take the rain. But, alas, the pattern does not change too much and it would appear that we’re in store for another pretty cold stretch after Tuesday as, after again being around 40 or so we fall below freezing Tuesday night and do not rise above 32 through next weekend. In fact, several days will feature highs in the 20’s. Snow returns to the forecast for Thursday behind which arctic air spills down. At this point, the morning golf game next weekend may be tough as we’ll probably be in the single digits each morning. Hope you’ve been nice to LG&E. On This Date In History: Last year, the East Coast, most famously the Washington DC area, had a few giant snow storms. Some folks blamed Global Warming. Around Christmas this year, the northeast got slammed by a big old system that dropped 20 inches on Central Park and gave the mayor a big headache. Now, there is another similar system that has dumped a bunch of snow and ice in the South and promises to adversely affect the northeast again. My bet is that New York will get a significant amount of snow but I suspect that Boston will be closer to the target of the 2-foot-type snow totals and blizzard warnings. In between these events, we had a tornado outbreak in the Ozarks and parts of the Midwest. Ironically, parts of Arkansas that got whacked with twisters a couple of weeks ago have now had to deal with the snow and ice. I have fully expected Global Warming articles but haven’t seen much yet. But, you know what? It is not unprecedented. I recall a January tornado that caused fatalities in Owensboro not too many years ago. This is a La Nina year and that may have more to do with the persistent pattern we’ve had and when you get a change in the pattern, well, then severe weather can occur in between the wintry stuff. At this point, the models way out are suggesting another potential severe outbreak in the Ozarks in a couple of weeks. Not sure if it will happen, but its out there. While its been snowing in Atlanta, its been in the upper 70’s to near 80 in South Florida, that is about normal. As I alluded, it’s not out of the question that we get a warm up for a few days in the South in a couple of weeks. Winter weather is not unusual and neither are warm ups, which are so common that it is known as a “false spring”. In the Midwest, January 11,888 had been unseasonably warm as had the morning of January 12. A cold front came barreling down with air that dropped temperatures well below zero with high winds. Some reports of the day say that the mercury fell 100 degrees in 24 hours. ..while its possible, that may be an exaggeration. When the mercury fell, the snow began to fall. Most likely a shortwave blew up from the southwest and grabbed all of the warm moist air to the south and threw it over the cold air. People who had gone to work and especially school children had not dressed for the extreme cold as the whole thing was a total surprise. 235 people died that day, many of them school children trying to get home. 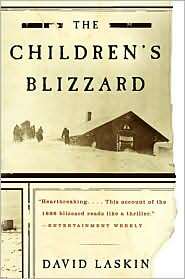 Hence, on this date in 1888, the Midwest of the United States suffered from what is now known as either the “Schoolhouse Blizzard,” “The Big Brash Blizzard of 1888” or the “Schoolchildren’s Blizzard.” One story holds that a teacher was trapped in her schoolhouse with 3 children and by 3 pm they had run out of heating fuel. She tried to lead them 82 yards to her boarding house. Visibility was so poor that they got lost in the short distance and the 3 kids died. She survived but lost her feet to frostbite. There are many other tales of rescues using rope to tie children together as they tried to get to safety. 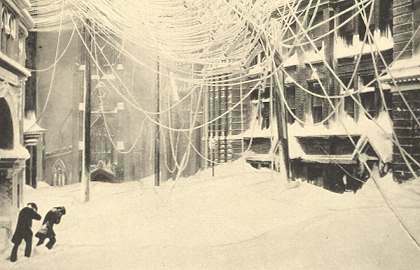 The meteorological details surrounding the 1888 blizzard are interesting and the individual stories quite harrowing. Extreme weather changes have gone on in this country in the winter for a long long time….long before anyone thought of global warming. Its just that now we have better forecasts to be able to prepare. It was a tough winter in 1888. In March, New York City had one of its greatest snowfalls and blizzards. From March 12-14, about 50 inches fell and wind drifted the snow to up to 40 feet. The city came to a standstill. The storm adversely affected cities all up and down the East Coast, including Baltimore, which had temperatures in the mid 40’s the day before the storm hit. 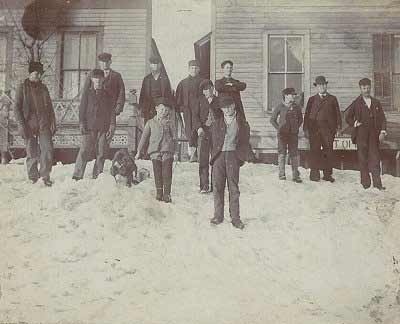 And that winter of 1888 was well before anyone suggests that climate change had any effect on the weather. Weather patterns really haven’t changed all that much, it’s just that forecasting has gotten so much better as well as communications. But, snow forecasting remains very difficult and the TV honchos who aren’t on the air insist on public relations campaigns that elevate their tv weather folks to mythical proportions. Even if a station has a top shelf Meteorologist like Jay Cardosi or Matt Milosevich, Kevin Harned or Marc Weinberg, it’s far from perfect. It doesn’t help when a tv outfit hires a broadcaster and then labels them as a Meteorologist. It’s really not fair to that person. Either way, snow/sleet/ice forecasts can be really beyond human abilities and so they change. The difference between an inch of snow and 5 inches is not much. And when you throw in ice potential, it really creates a challenge. Be thankful for what we have today. Those kids in Nebraska in 1888 could only dream of having someone alert them to the potential danger as did the people along the East Coast later that year. 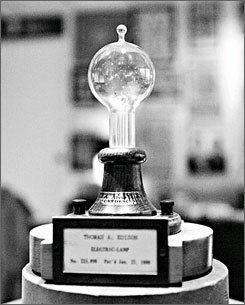 On This Date in History: In 1876, Thomas Edison did perhaps the smartest thing he ever did. He created an invention factory. He moved his staff of 15 people into a large clapboard building filled with all sorts of scientific equipment and chemicals in Menlo Park, New Jersey which was then just a small rural hamlet. I’m not certain but it may have been the first research laboratory ever established and Edison proclaimed that he would produce “a minor invention every ten days and a big thing every six months or so.” At the time, many thought the claim was preposterous but 10 years later, Edison had been granted 420 patents…that averages out to one every 3.5 months. Perhaps his most famous invention was the first practical incandescent light bulb. Note the word “practical.” See, other people had applied for patents for lights but they didn’t last too long. They tried to “sub-divide” electric light or somehow make it weaker. Edison for his part kept trying to use a filament to electrify and make glow. He kept trying platinum but it kept burning up. So, he used a sort of cardboard covered in carbon but that didn’t work so well either until he created a vacuum in glass. The filament didn’t burn but instead glowed brightly. On this date in 1879, Thomas Alva Edison lit up the new year by demonstrating for the first time publically his incandescent light. A couple of other items. First off, by June 1882, Edison had demostrated how the light could be used in a system and wires were laid and a small area of New York was illuminated. But, on August 1, 1883 20,000 incandescent lights burned brightly in the largest display ever seen in the world. I believe that represented more lights than existed in all of New York City. The place of this display? Louisville, Kentucky at the Southern Exposition. 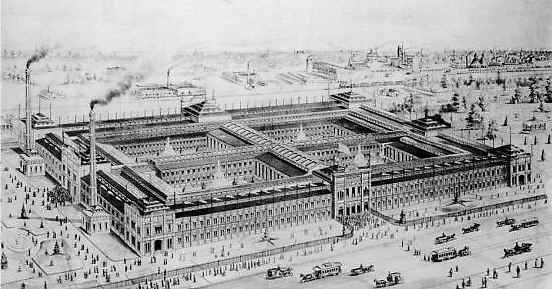 The building was a huge palacial area that stood for five years during the time of the exposition. It stood where you will find St. James Court today. Now, Edison gets all of the credit for the electric light and a whole slew of other inventions. But, he had an entire staff working for him. I’ve always wondered how many of those inventions really came about due to the ideas and work of his staff. Certainly it was Edison’s inspiration, but I wonder about the rest. I suppose it may be a case of those who have the gold makes the rules. On This Date in History: Thanksgiving has come and gone and Black Friday is in the record books. I”m not sure how the day after Thanksgiving has turned into such a big deal. I suppose that its been coming for some time. 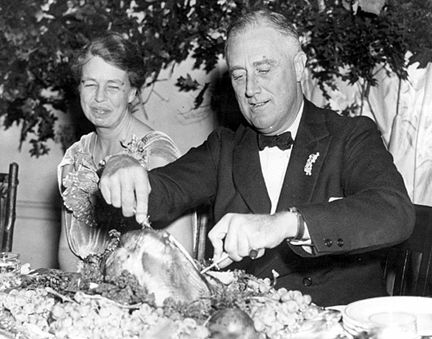 Previously, I had outlined the genesis of Thanksgiving and related how President Franklin Roosevelt had once tried to move Turkey Day to a week earlier in an attempt to add an extra week to the holiday shopping season. Sorta a disguised depression era stimulus plan. It didn’t work and the experiment was scrapped after one year. I’m not sure what is taught now, but when I was a kid, we were taught in school about how the Indians hooked up with the Pilgrims near Plymouth Rock to have a big feast in 1621. Today, we sit around stuffing ourselves with Turkey (not the vegetarian Snow White) and watch football games with our eyes closed and belts loosened. Trouble is, the Puritans on the Mayflower didn’t call themselves Pilgrims; they referred to themselves as “Saints” which seems a bit presumptuous considering not too many years down the road they were burning “witches” at the stake. The other thing is that the real first Thanksgiving was on this date in 1620 and it was in Virginia. 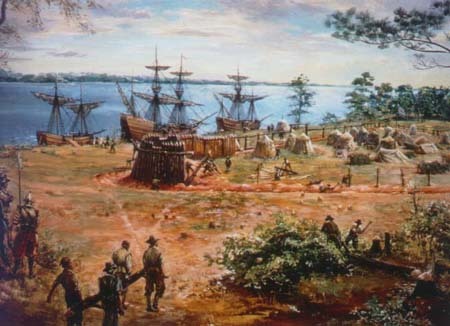 The first permanent English settlement in the New World was Jamestown in 1607 in the Virginia Colony and it wasn’t doing too well. The settlers didn’t know what they were doing and the winters were harsh…remember this was during the mini-ice age. 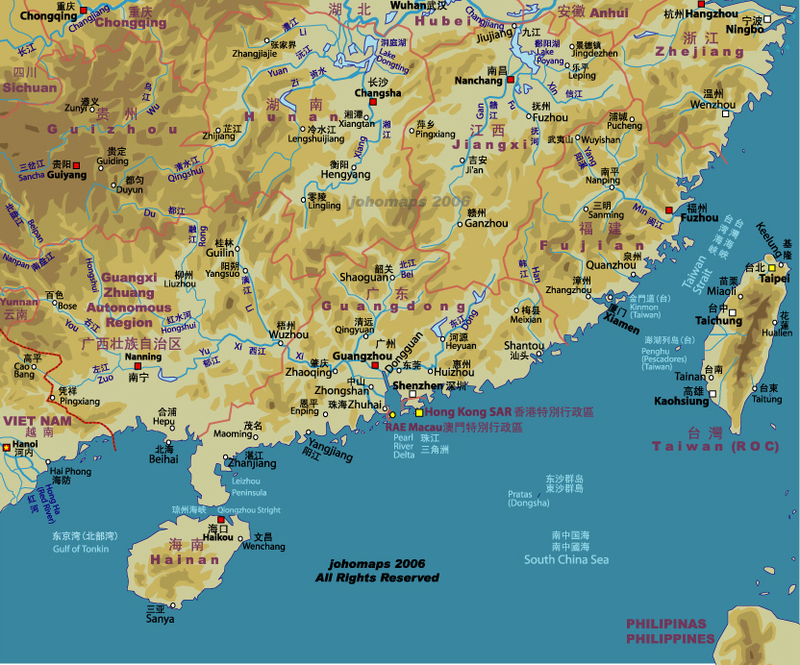 Anyway, by the spring of 1610, the colonists were coming off a tough winter and only 60 of the original 409 were left. Sounds like a good time for prayers to me! And that’s what they did and when help arrived in the form of a ship with food and supplies from mother England, they gave thanks with a prayer service. I guess they weren’t a sentamental lot because they never did anything to commemorate the event. Two other groups came to Virginia. 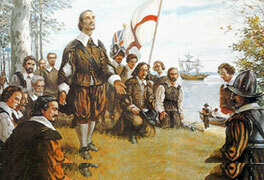 They were supposed to arrive in Virginia but one(the Mayflower) ended up in Plymouth in 1620. The other (the Margaret) made it to Virginia on December 4, 1619 and their charter read “Wee ordaine that the day of our ships arrival…in the land of Virginia shall be yearly and perpetually keept holy as a day of Thanksgiving to Almighty God.” On December 4, 1620 they commemorated their first year in the colony, not with a feast, but instead they did the opposite and fasted as they prayed. Guess we got that part wrong too. The colonists who landed at what they called Berkeley Hundred didn’t get a chance to mark their second anniversary…some were all killed by Indians and the rest retreated to Jamestown. Maybe they were upset that they weren’t invited to the First Thanksgiving. Weather Bottom Line: We have another pretty good shot at some snow and this time it will probably be more substantial than what we got on Thanksgiving night. The long wave pattern is such that there is a dominant and persistent trof in the Eastern half of the US. The reason why its persistent is because there is a big fat high, or ridge, in the middle of the Atlantic. There is also a big trof on the front side of that ridge. That forms a pattern that looks like the greek letter Omega, which is why its called an Omega Block. Typically, the Omega pattern is one that puts the breaks on progressive change in the long wave pattern; hence the name Omega “block.” So, England has been getting slammed with big time snow along with much of the rest of western Europe. And on this side of the pond, there is the persistent trof with the storm track running from the northern plains throgh the Ohio Valley to the Carolina Mountains. So, we have another strong shortwave zipping down the storm track through the area. We have some moisture to work with too. The heaviest snow will be to the left of the core of that shortwave or “upper low.” It will be impossible to forecast exactly who gets the biggest snow until about 12 hours before its arrival. The ETA advertises some 4-5 inches for our area. The GFS has the track about 50 miles farther east or northeast and so it only has about 1-2 inches. Take your pick. My guess is that both will be true for the area, but not for everyone in the area with folks over toward Frankfort having a better chance of 4 inches than the people in Lanesville, Indiana. After that, the cold air will spill in behind and it will remain chilly for the forseeable future until the Omega Block decides to move. All the fun and games came to a crashing end on this date in 1940 when steady winds of just 42 mph made the bridge sway…and then leap. It continued throughout the day until the entire structure failed. 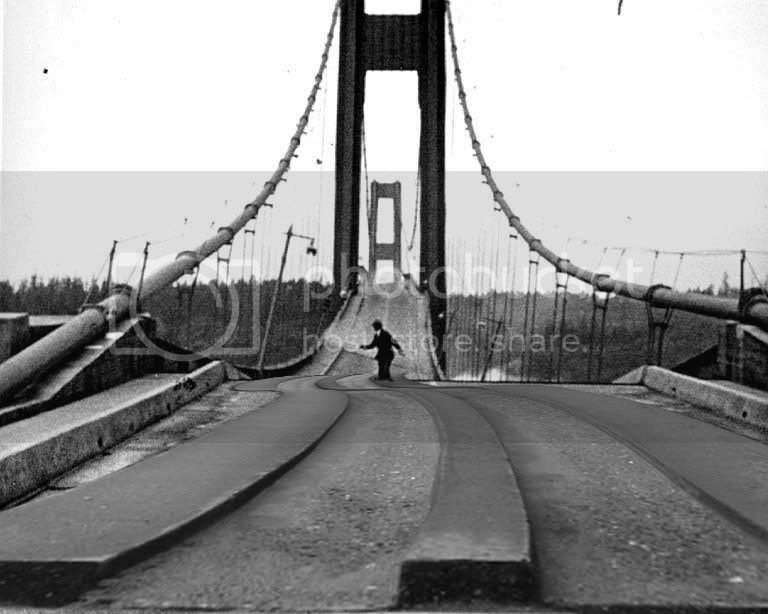 The bridge had been closed but the last man let across lost control of his car and, in fear of being tossed 190 feet into the Tacoma Narrows below, he fled on foot. He tried to retrieve the family cocker spaniel from the back seat but the pup would have none of it. As he reached the end of the bridge, the bridge collapsed spectacularly with the dog as the only casualty. The result of the collapse was analyzed and is a common subject in college physics classes. Basically, the wind was in tune with the natural harmonics of the bridge. The more the wind blew, the greater it increased the amplitude of the harmonics creating a wave. Its a similar phenomena as when a singer breaks a glass. 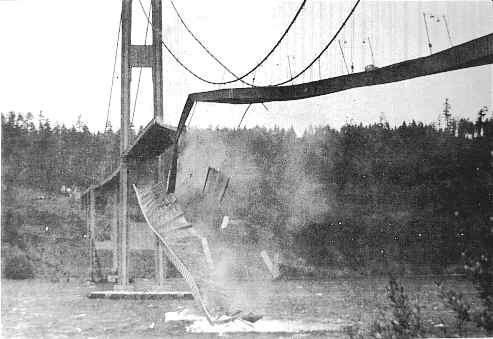 To avoid a similar fate, bridges today, including the one that replaced “Galloping Gertie” have damping and aerodynamic features built in and wind tunnels are used to test the ability of the structure to resist wind and prevent compromise of the integrity of the structure. Whatever man builds, can come down. Gravity and other forces are constantly at play. There are some things in life in which compromise can be a good thing. But engineers cannot afford to not get it right the first time. It kinda reminds me of what US Grant often said, “man proposes; God disposes.” These days we often teach our kids that close is good enough. If that is your methodology, mommas don’t let your babies be engineers. On This Date in History: In 1817, DeWitt Clinton became governor of New York following a victory we only see today in totalitarian countries. DeWitt received almost 97% of the vote as he gained 43, 310 votes with those opposed only registering 1,479 votes. That kind of victory would give anyone the notion that perhaps he had a mandate. Only trouble was that he had promised something that had never been done and many suggested could not be done. You see, the United States was still a small, largely coastal nation but expansion contintually pushed the nation westward through the continent and away from the coast. Trade was a great necessity for the fiscal stability of the nation and for the needs of settlers in the nation’s interior. 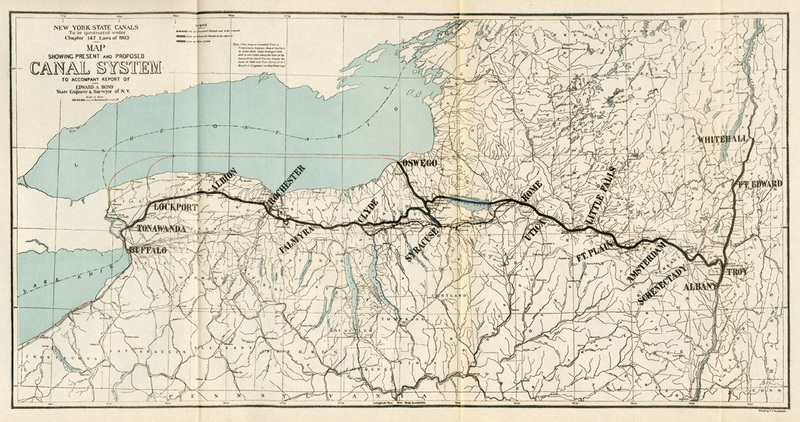 Roads were unreliable and rivers didn’t flow toward the East Coast so a great need developed for a quick, reliable way to connect the interior parts of the nation to the seaports on the East Coast. An impediment was the Appalachian Mountains and, not only did the mountains impede economic concerns but they also were a potential limitation to national security. If the young nation could not find a way over or around the Appalachians, then it could lose its frontier to Britain or France. Undeterred, Clinton went on a crusade to build the canal. Using the power of his vote total, he proposed and the legislature passed a funding bill but the legislative approval was not the final tally. New York had a Council of Revision which was made up of 5 men and they had to approve the measure. Two were in favor of the canal project and two were firmly opposed. That left it up to one man to decide. That one man was New York Supreme Court Chief Justice James Kent and he was all set to vote “no” when he got a surprise knock at his door. US Vice-President and former New York Governor Daniel Tompkins made a call and he told Kent that another war with Great Britain was imminent. The Vice-President cautioned that New York should not waste its time and money on such a foolish project. Most of the time, presidents tend to want vice-presidents to be seen and not heard. If Tompkins’ feeling mirrored those of the adminstration, then President James Monroe would have done better to send his VP to a funeral than to pay a call on the Council of Revision. Kent was so peeved at the intrusion and saber-rattling attempt at coercion that he said, “If we must have a war, or have a canal, I am in favor of the canal!” An odd twist to this part of the story is that Tompkins had been plagued by charges of misusing federal funds while serving as governor of New York. I’m not sure if it was considered a “shovel-ready” job, but the shovels must have been ready because work began on the job in July 4, 1817 and it was initiated in an easy spot. The land west of Frankfort in Oneida County was soft and level. 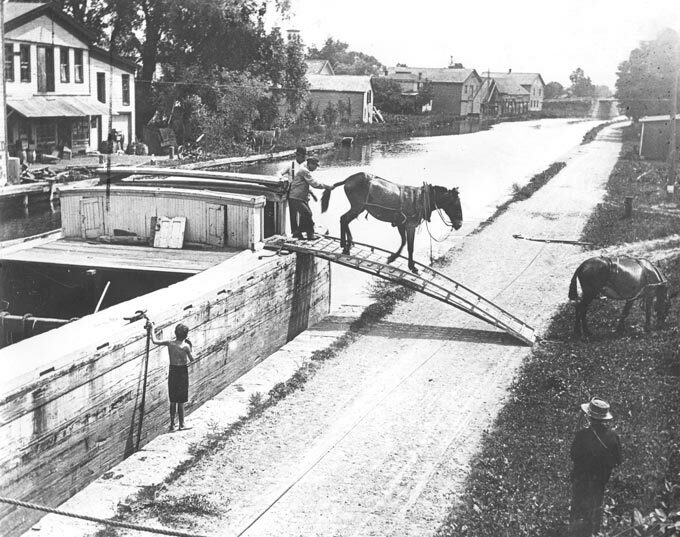 By today’s standards, or even those of the late 19th century, the canal was quite small. The specifications called for the canal to just be four feet deep and only 40 feet wide. Bret Favre could possibly have thrown a football across the canal without throwing an interception. But, one must remember that flatboats were relatively small at that time and the boats that used the canal had to be pulled along by animal power. 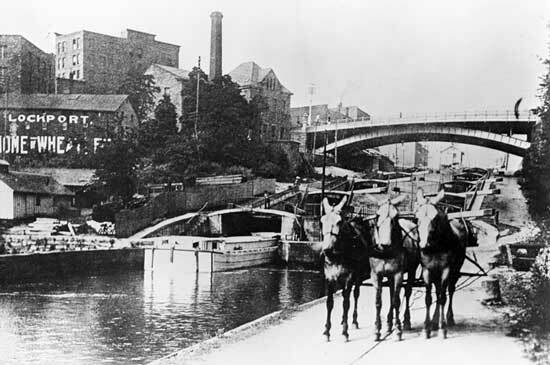 Teams of mules or horses walked along the banks of the canal with the boat in tow. 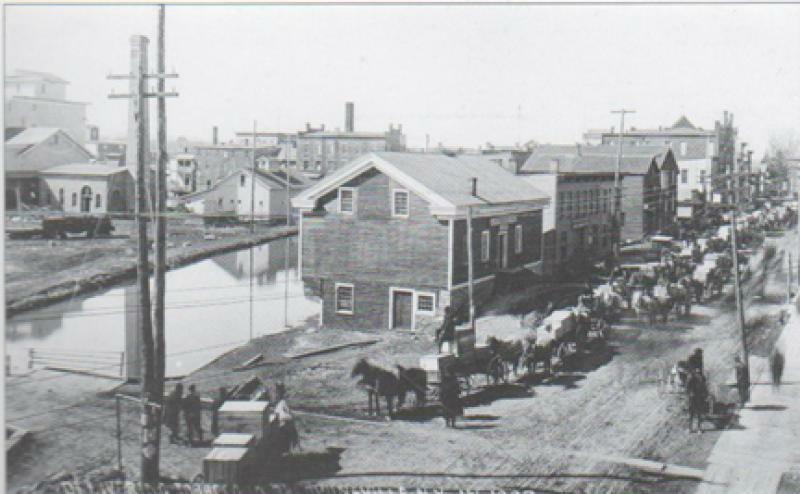 Before the canal could be dug, trees had to be cut, stumps removed and underbrush cleared. Parts of New York State were still quite an untamed wilderness so such an undertaking was no easy task. 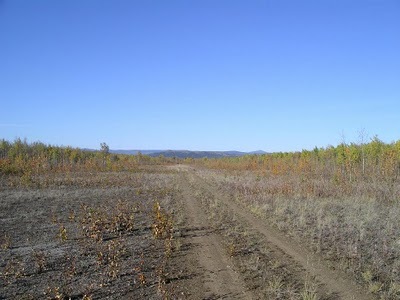 The clearing work was done in sections as small as just a quarter mile long. Local contractors and farmers contributed animal and human muscle to the endeavor, though some work-related contraptions were invented to help with the work. 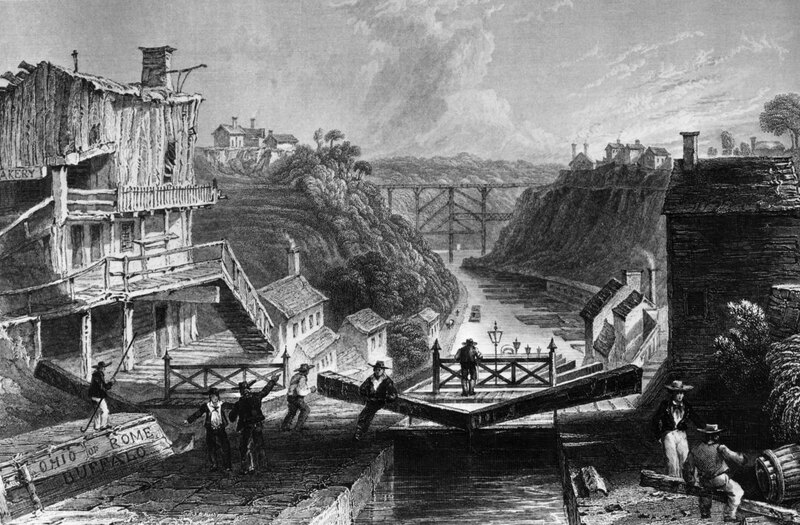 Within the challenge of overcoming the elevation change was problem of how to construct the Erie Canal locks. Canvass White was considered by many to be the most gifted engineer on the entire project. He had been recruited for the project by Governor Clinton who suggested the young engineer go to England to study that country’s canals. He did so on his own dime and studied the methods used, including the use of hydraulic cement to seal the mortar used to connect the stones. But, importing hydraulic cement from Europe was costly so they tried to simply coat the mortar with a thin layer of hydrolic cement. It was no solution because it would take no time at all to crumble. As it turns out, while digging the canal, limestone was discovered that doubled as a natural cement rock. White, who was working on the middle section, calcinated the local rock, turned to to powder and mixed it with water and sand. The new substance was found to harden with time under water and form an underwater cement that was far better than anything used before. White patented his new discovery and the new material caught on rapidly. Trouble was for Canvass, no one paid much attention to the patent and he received next to nothing for his effort. When he died, his wife was left with an estate that included little more than the house furniture which she subsequently was forced to sell. 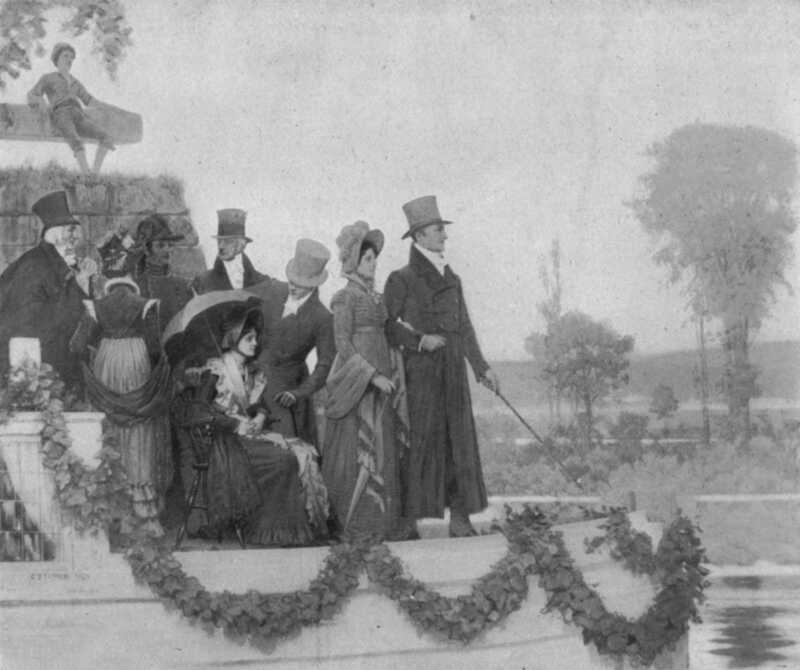 In the end, the Erie Canal not only proved that great engineering obstacles could be overcome, even with lawyers in charge. It also showed that government could effectively build a public works project as the total cost came in at $7 million and it was paid off in tolls after just 12 years. 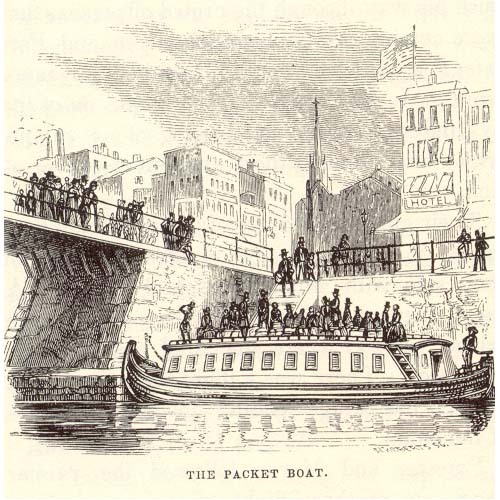 Between 1836 and 1862, the canal was enlarged to a depth of 7 feet with a width of 70 feet to accomodate the larger boats and needs of the expanding nation. The number of locks was reduced by 9. By 1900, boats had outgrown the canal and once again expansion was needed. An enlargement project was proposed in 1903 and completed in 1918 that increased the depth to 12 to 14 feet, broadened the width to 120 to 200 feet and reduced the number of locks to 57 that could handle barges carrying up to 3000 tons of goods. 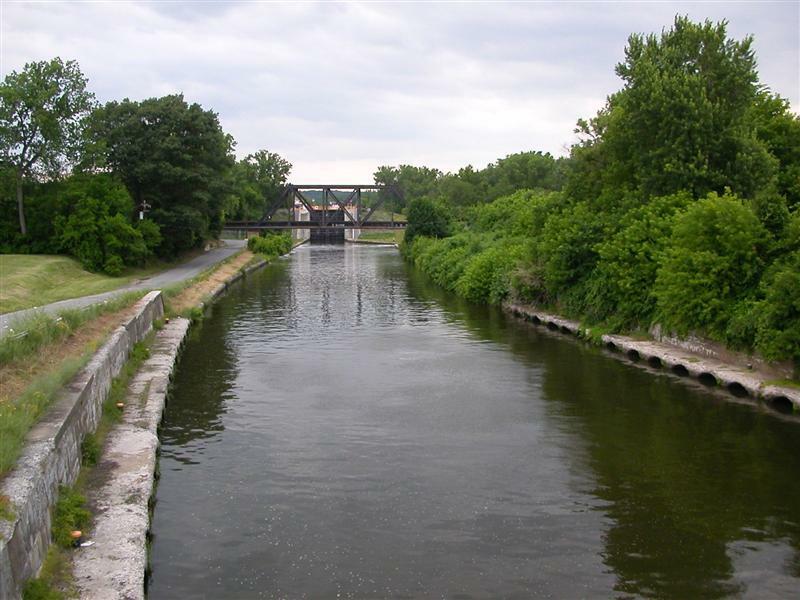 Today, the Erie Canal is used largely by boating enthusiasts and not be commercial traffic but, in its day, it was a true marvel. 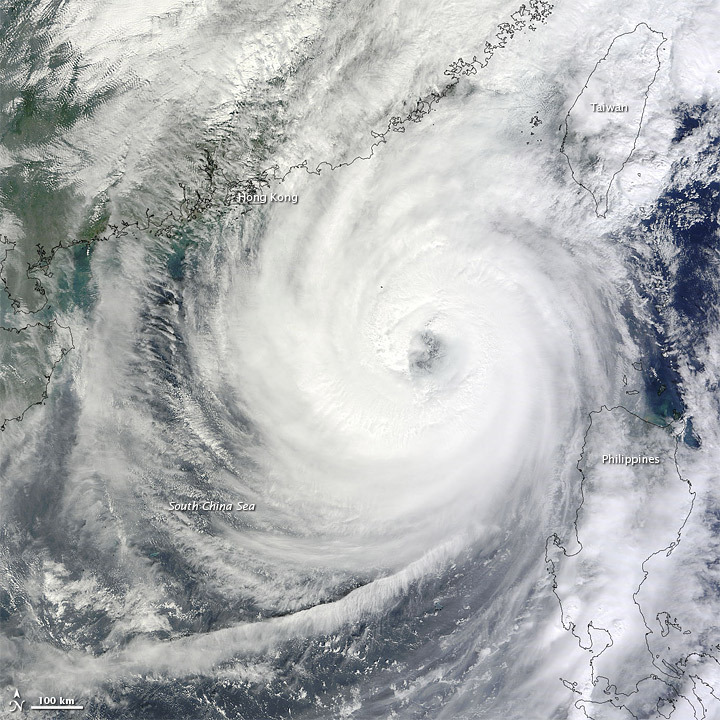 This situation is not very unusual to have such a storm this time of year. In fact, this situation is really a bit similar to that of the in 1975 when the Edmund Fitzgerald sunk. In that situation, there was an extremely deep low pressure area making its way across the Great Lakes that produced very strong winds and the result was huge waves on Lake Superior and Michigan. The common nature of the scenario is why Gordon Lightfoot referred to the storm as the Gales of November. Mariners know that there are some tough weather conditions found in November in that area and Lightfoot had the famous line “When the Gales of November come early”. Well, this is a little before November so I’d say that the Gales of November will be coming early to the Great Lakes as this storm will have a central pressure of about 959 mb which is would support a category two hurricane. Like the storm with the Fitz, this storm will have a very long cold front extending south that will sweep through the area. It will be racing through so the action will be quick and possibly rather ferocious. Want To See the $7.2 Million Dollar Check For Alaska Purchase? Gov. 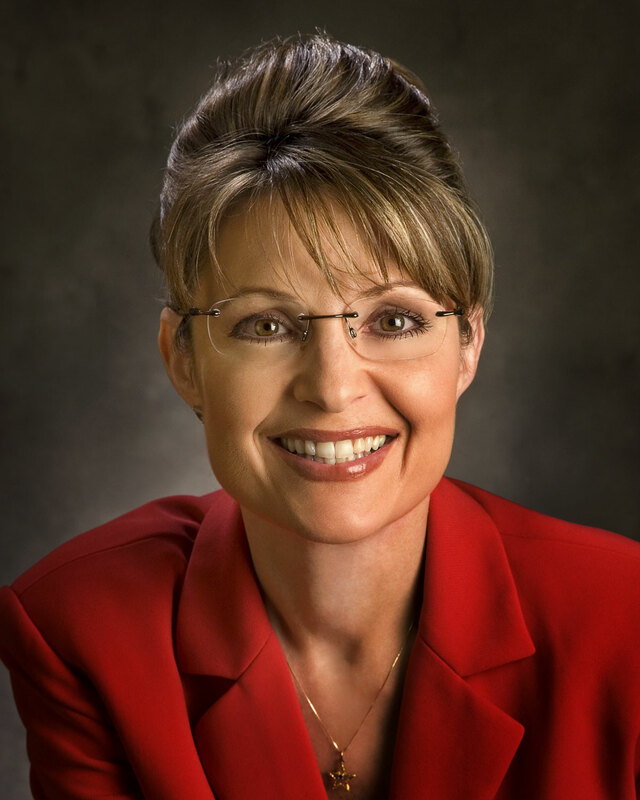 Palin Owes Career To William H Seward? Governor Palin’s Path is Set: Had it not been for the dogged determination of Secretary of State William H. Seward, Alaska Governor Sarah Palin may not have been the Vice-Presidential nominee of the Republican Party in 2008. It was not an easy task, but, ultimately, Seward got Congress to simply write a big’ol check to the Russians and America had gained the final frontier. In the 19th Century, Russia laid claim to the Alaskan territory with the establishment of the fur-trading Russian-American Company. The company was quite profitable for awhile but by the 1860’s, business wasn’t too good. In order for the company to remain viable, the Tsar would have to heavily subsidize operations. But, only a few hundred Russians had emigrated to Alaska and the Russians had no way of defending the vast region. The Tsar and his ministers thought it was in their best interest to sell the land to the Americans rather than lose it in battle to one of the world powers, like Great Britain. Thanks Bill! Monty Hall Would Be Proud! In 1867. Secretary of State William H. Seward began negotiations to acquire the territory. Now, Seward was a hold-over from the Lincoln administration and was serving under President Andrew Johnson at the time. Johnson became quite unpopular due to his Reconstruction policies and some in the public derisively called the plan “Seward’s Folly”, “Seward’s Ice Box” or “Andrew Johnson’s Polar Bear Garden.” There were also facticious calls for the opening of the “Polar Bear Bureau” and the establishment of the “Superintendent of Walruses.” At the time, it was seen as a vast, empty wilderness opposed by many public figures such as Horace Greeley. But, some histories now suggest that most of the general public thought it was a shrewd deal. Political opponents in Congress who were trying to figure out how to impeach Johnson delayed approval of the $7.2 million needed to complete the deal. Perhaps because public opposition wasn’t as great as has been advertised because Congress ratified the deal on April 9, 1867, though it did by just one vote. The Senate’s approval opened the door for the United States to acquire an area about twice the size of Texas for the purchase price of $7.2 million, or about 2 cents an acre. Funny thing is, Congress didn’t appropriate the money until July 1868. I’m guessing that, while the Senate is charged with approving treaties, the House of Representatives has a say in the approval of funding and I suspect that opponents in the House hoped to halt the purchase by keeping the purse strings tight. If you notice the check above is dated August 1868 so there must have been some politicking and horse trading. Guess the Tsar didn’t care too much about the slow payment but I suppose any Americans who were in Alaska before the check cleared could have been considered considered to be squatters. In any event, the deal got done and the public remained generally non-plussed about the whole thing until gold was discovered in 1896 the territory’s Klondike region and suddenly the acquisition wasn’t such a folly after all. As time went on, the deal became to be on par with buying Manhattan for $24. 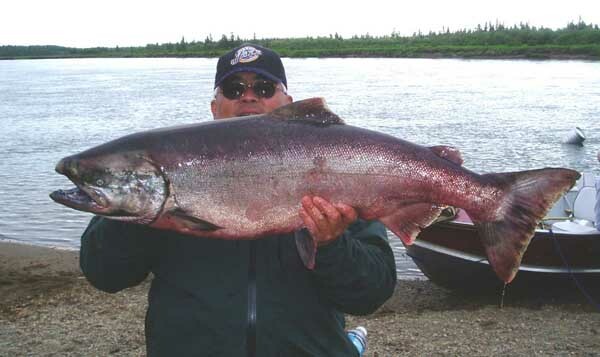 Today, 20% of America’s oil is found in Alaska and about half of the seafood. It also produces a huge amount of natural gas, timber and other natural resources. Pokiness seems to be part of Alaska’s history because, after Congress delayed cutting the check, it took until 1912 to establish the Alaska Territory. And statehood wasn’t exactly around the corner from there. Andrew Johnson's Polar Bear Swimming Pool? Today, it has produced “Sarah Barracuda”, the first female Republican nominee for Vice-President. Alaska became a state in 1959 which seems kinda odd when one considers that California gained statehood very shortly after it’s gold rush broke out. Alaska is too big for just one day of recognition so there are two state holidays marking its heritage. One is “Seward’s Day” which is in March every year to mark the day that William Seward signed the treaty (Mar 30, 1867) and the other is “Alaska Day,” which commemorates this date in History when on October 18, 1867, the United States formally took possession of the 586, 412 square miles of Alaska. If this Global Warming caper goes the way that Mr. Gore suggests, then “Andrew Johnson’s Polar Bear Garden” will have to find a new name…perhaps “Andrew Johnson’s Polar Bear Swimming Pool” would be more appropriate. Weather Bottom Line: We need rain. Count yourself lucky if you get it this week. Officially, Louisville has gotten .56 inches of rain since Sept 1. Now, climatologically, Sept and Oct are the driest month in Louisville but his is a bit out of hand. A boundary snuck through yesterday but its not too far to the south. The previous thinking was that a wave of energy would run along that front and bring us some light rain on Tuesday. But, the front appears to be inching farther south so when the wave goes by, the rain will be mainly in Tennessee. That’s okay because they could use it too but…anyway, maybe a slight shot on Monday night or Tuesday but probably only if you do a rain dance in your backyard. Cooler air filters in beginning Tuesday and we will at least be pleasant with highs in the upper 60’s Tuesday and lower 70’s the rest of the week.